Not a long while ago the net was exploding with Corrie White’s Fun with Water set on Flickr. Her control over those drops, their color and their timing was remarkable indeed. 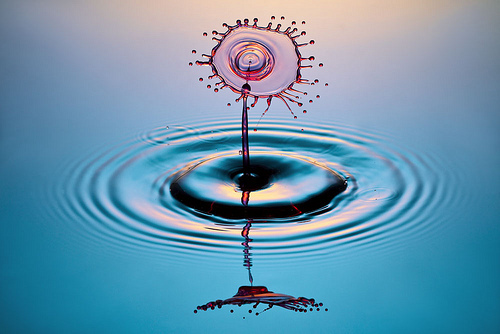 This is why I am very exited to share Corrie’s very extensive guide for water drops photography. The guide is for all levels going explaining the setup, lights, optional use of a drip mechanism and post. Starting with water drop photography is fairly easy, you need nothing more than a camera and a way to make drops. As with any craft, when you’ve exhausted the equipment you are using you can get more equipment and take it to the next level. Bear in mind, though that some of those amazing images were shot with nothing more than a camera and a tripod. Here is what it come to in the end. 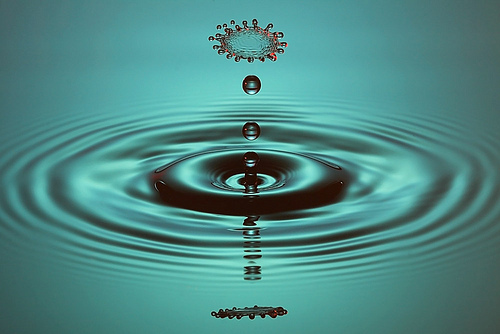 The first thing you will need to take care of is creating the drops. I started out photographing water drops using a turkey baster, which has a large drop, but is unstable and hard to control. As I progressed, my main dropper became a medicine dropper which had a softer bulb and was more suitable for controlling the pressure for releasing drops. The dropper was very well taped to a sturdy board so that it wouldn’t move position when drops were released. I used the timer on the camera to open the shutter in 5 seconds. Just before the shutter opened I would release at least two drops in quick succession (about 7 – 10 per second). 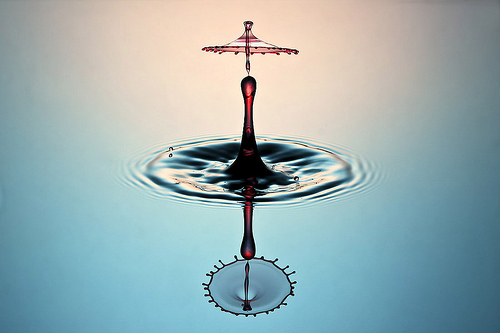 The height of the distance between the tip of the dropper and the water level varies to control the shape and impact of the drops. I use anywhere between 30 and 60 cm. 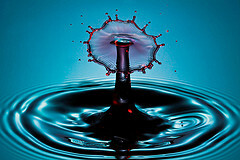 As I got even more involved with water drop photography I got a drip kit. This opened up a whole new world of water drops. I now have control over which type of drop I want (small/big) and am always pushing it to the limit to see what it can do. With the Drip Kit I can also control the interval between drops, the size of the drop and the flash lag. I always set it to release two drops. 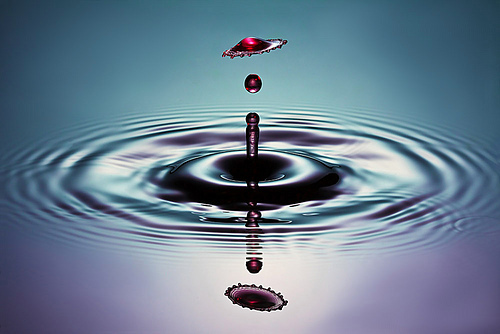 Even in the three drop splashes, the third drop is a result of the drip valve not closing fast enough when it’s set for large drops. These three drop splashes are done with a short interval between drops, a large drop size and the flash lag is variable to get this splash in various stages of the splash. It takes a lot of tweaking of the settings to get to the three drop splash. One of the problems with the larger drops is that the second one quite often falls slightly off center causing the crown to be tilted. I simply keep shooting until I get a horizontal one. Stray drops can be a problem. It’s the nature of water. Sometimes, though, the stray drops can make a splash more interesting. I do a lot of shots to get various splashes, but only keep the most interesting ones. 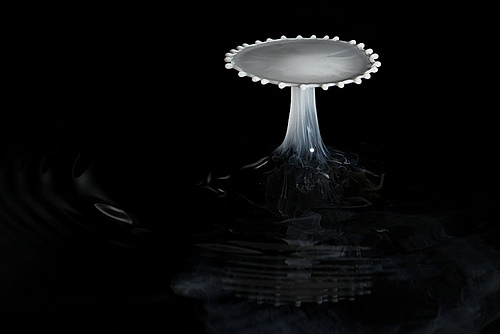 When I first started out photographing water drops, I used only the built-in flash in the camera. A lot of the early ones on my “Fun with Water” set were done this way. I would use white cardboard behind and on the sides of the water container to reflect more light on the splash. The more light you can get, the less noise you will have on the image. One very important key to freezing the action is to have your “Flash Exposure Compensation” on a very low setting. It is this low setting which will freeze the motion of the splash, not the exposure setting. If your setting is too high, you will end up with a blurred splash. 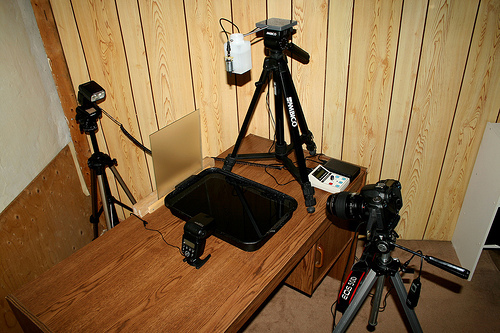 Positioning of the flash guns vary with the type of lighting I want. Usually I have both behind the drop, one higher than the other to cover the surface of the water tray. 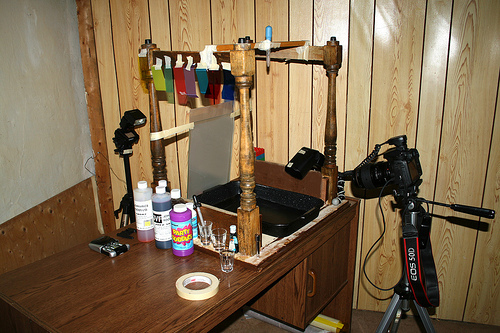 Directly behind the water tray, I use acid-etched glass with some extra plastic sheets to use as a light diffuser. This gives a nice soft overall light on the surface of the water and will result in a good reflection. Sometimes I will have one flash behind the tray and one on the side. When I am using milk for the liquid, I will use a coloured plastic sheet behind the drip tray and have the flash guns set about 4 p.m. and 7 p.m. in front of the splash site and directed partly at the backdrop for optimum light. Colours in the drop liquid are from food dyes. Colours for the background are from coloured plastic behind the tray, but usually, coloured gels on the flash guns. Gels are coloured plastic which can be bought at a camera shop, but are far less expensive when bought at the dollar store in the school supply department. These are cut to fit over the front of the flash gun and taped to the sides. Also, mix the colours. For example, yellow food dye in the drop water and blue food dye in the water tray will give you a blue base, a yellow crown and a green stem. Experiment with colours. The liquids I use are water, milk, almond milk, cream or combinations of these. Milk is good for starting out with drops. 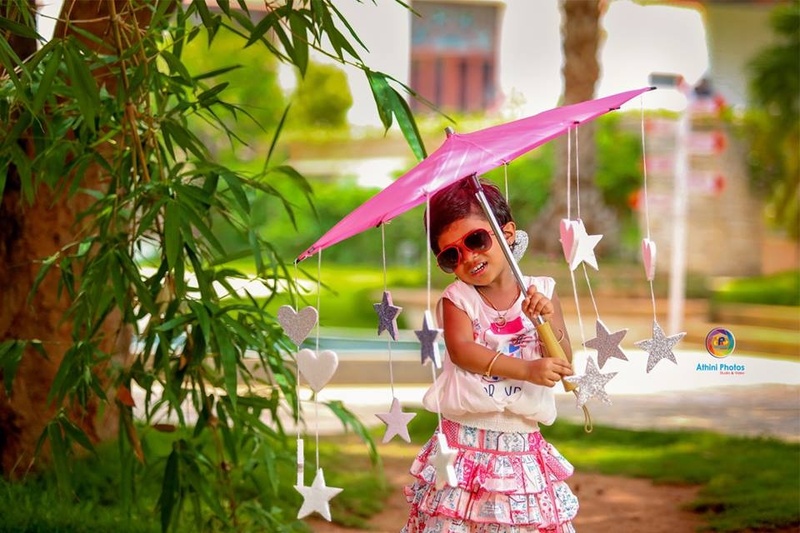 It has a higher viscosity than water, making it easier to catch a well-formed umbrella splash. Almond milk is good, but leaves a grainy texture. Water is harder to work with because it has a lower viscosity and flows very quickly. Water is most dense at 4 degrees celcius, so it is better to use colder water (throw in some ice cubes). With water I will use some additives. Rinse aid – just a couple of drops with give it some elasticity (also some bubble mess). Dissolved sugar or syrup with thicken the water, but will also give the splash a mottled appearance. A bit of glycerine added to the water helps a bit. 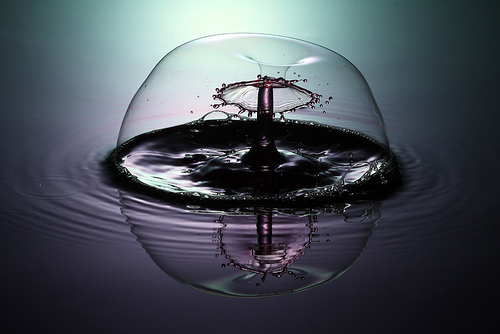 I have used a clear household cleaning gel which will give you the long stringy droplets (like tendrils), but leaves a lot of bubbles in the water tray, so you have to blow them away between each drop (or clean up in photoshop). Lately, I’ve been using some guar gum, a powder which is used to thicken liquids. Use only about 1/8th teaspoon in a cup of warm water, beat with a hand blender, cool and strain. This works well but is very lumpy and grainy so it needs to be strained well. I haven’t been able to get the 3 drop splashes with plain water, therefore, I use an additive to slow down the movement. For the clearest drops pure water with a quick burst of light is best. Ideally, 100 is the best ISO setting. I use 200 to get the bit of extra light when I need it. There’s often a fight with noise when you use dark backgrounds and high ISO settings. Exposure varies. With the manual drops, I used an exposure of 1/250 to sync with the flash guns. I now use 0.5 seconds to compensate for the delay of the flash I need to have the shutter open for this length of time to catch the splash. This makes it necessary to have the room dimly lit. Aperture is a tough one. I normally use f10.0 to f14.0 to get enough light yet not lose the focus on most of the splash. With a macro lens you normally won’t get the whole of the splash in good focus, but one remedy is to back the camera up a bit and do a small crop later in editing. I always use a Socket wrench shaft extender for focusing aid. This way I can release a drop into the center of this and focus on the outside to get most of the front of the drop in focus, which is my preference. A lot of water drop artists use a serrated bread knife and I’m sure there are lots of other ideas for focusing. One thing I like very much about the 50D camera is being able to use the Live View feature which enables me to zoom in up to 10 times and focus using the LCD screen. For enhancement, I usually boost the levels to brighten the image, clone out a few stray drops and unsightly bubbles in the water, and add a bit of sharpening or noise reduction when needed. 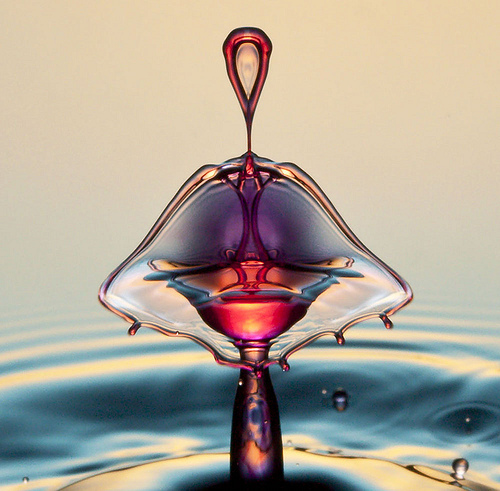 Patience, persistence, and perseverance are necessary qualities of a water drop photographer. Creativity is also very helpful. 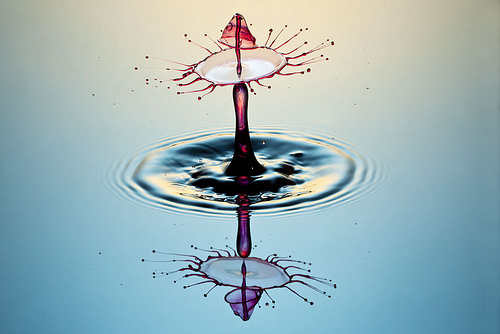 Learn to understand drop behaviour and recognize the signs of various stages of a splash to help you get a good result. Experiment and have fun ! Corrie has a new ebook that explains nearly everything. Some really lovely images here. I especially like the more low key ones, where the water really jumps out at you. Cheers! Great works here . Very well dune . I like droplets to . Very nice article! For the life of me I couldn’t find much information about splash photography for beginners till I found this (maybe I chose wrong keywords?). Thanks very much for writing and posting it as it pure gold!